Shopping at Walgreens can be a little tricky and a bit confusing. Hopefully we can answer a few of your questions and make it less confusing and a bit more fun. 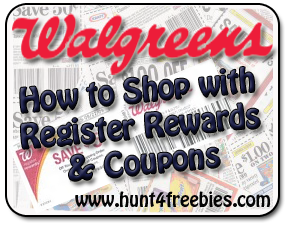 You can earn Register Rewards when you make a qualifying purchase of eligible item(s) advertised in Walgreens Weekly Ad, or an in-store promotion. It’s that simple. There is Limit of 1 coupon printed per offer per transaction. Meaning you cannot purchase two of the same item on a Register Reward promotion and get two Rewards printed in the same transaction. You can purchase multiple (different RR promos) in the same transaction and get the RR’s to print. Example, you can purchase (1) razor, (1) toothpaste and (1) shampoo and you will get all (3) RR’s at the end of your transaction. RR’s are manufacturers coupons, remember you are only allowed to use (1) manufacturers coupon per item. The RR is not designated to any one item, so you can basically purchase any item or items to equal the amount of the RR. If you were to purchase the same item that your RR was printed from it will NOT produce another RR for that item. You CAN use your RR to purchase other items that are on RR promotions and it WILL produce the RR for that item. Your number of manufacturer’s coupons and RR can no exceed the number of items purchased or the amount of your purchase. I have (3) items to purchase for a total of $12. I have (4) coupons that total $13. My total coupon exceeds the number of items and the total amount of my purchase, so to make this purchase I will have to add an extra item(s) to my order (Referred to as a filler). I want to keep my out of pocket expense as low as possible, so if I add a $1 item or (4) $0.25 items my total will be $0.00 (just pay tax). To try to get the most out of my RR I want to try to buy item(s) that produces more RR’s, so if in the above example if the toothpaste gets you $2 RR, Shampoo gets a $3 RR and body wash get a $3 I would get back a total of (3) RR’s total $8. Basically I got everything for FREE because I still have $8 in RR’s to use for other purchases. In-ad coupons can be found in the Walgreens weekly Ads, you can find the ads at your local Walgreens stores or in the Sunday’s Newspaper inserts. Instant Value Coupon (IVC) change monthly and can be printed on-line or you can find the booklet at your local Walgreens stores. Both the In-ad coupons and IVC’s can be stacked with a manufacturer’s coupon to get the most savings, sometimes making items FREE. Walgreens accepts one manufacturer coupon and applicable Walgreens coupon(s) for the purchase of a single item. Walgreens does have their Coupon Policy on-line. I would suggest you read the policy and print it and keep it with you. Some people have had issues with some Walgreens stores not accepting some coupons; it may help to have the policy with you. I have called Walgreens Corporate many times and they do try to help. They do state that the policy is just a guide line and the store mangers do have the right to refuse any coupon. If you have any issues with your store you can contact Walgreens Customer Services at 1-800-925-4733. If you have any questions you can contact us at admin@www.hunt4freebies.com or the contact form we will be more than willing to help.